« Um, you missed a little something over there. When my blog-friend Hannah came to visit us last week—and a delightful visit it was—Rilla fell in love with her on sight. Actually, we all did; I’ve known Hannah online for years, and it was wonderful to get to sit down with her in person and talk books and kids and the virtues of dirty floors and all those things we’ve conversed about in the interwebz for so long. Hannah’s visit passed way too quickly; there was far more to talk about than we could squeeze into a morning. We need an encore, this time with her kids too. 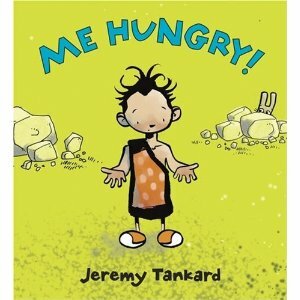 I think my favorite moment was when Rilla produced a copy of a picture book she has been entirely enchanted with these past couple of weeks, Me Hungry by Jeremy Tankard, and roped nice Miss Hannah into reading it with her. It’s about a cave-boy who tells his parents “Me hungry” but they tell him “Me busy” so he goes off by himself to hunt. He encounters a rabbit (“Me hide!”), a porcupine (“Me sharp!”), and a tiger (“Me mean!”) before running into a woolly mammoth who surprises him by becoming his friend. The caveman speech is funny and charming, not at all arch, the art is tremendously fun, and the little twist at the end elicits a belly laugh from my four-year-old every single time—seriously, after dozens of readings, many of them on the same day. The look on the daddy caveman’s face just cracks her up. But why oh why oh why didn’t I get a picture of Rilla and Hannah reading together? Me kicking myself! 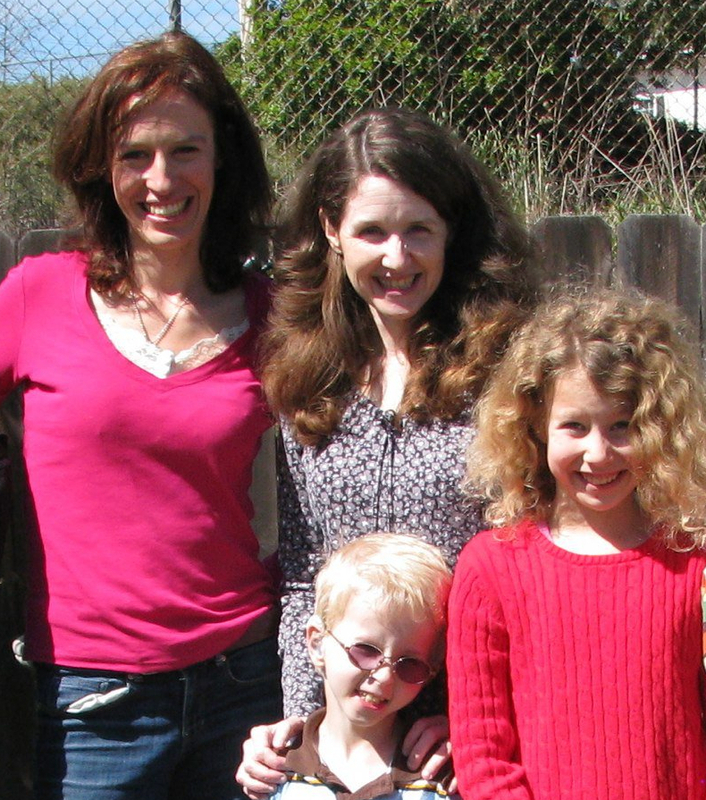 I have been blessed to meet two blogging friends…one came with her family of five to spend several days with us, too! The other was somewhat local…and we have continued our friendship! Me love that book, too! I’m wondering if Jeremy Tankard would come paint the walls of the nursery for baby-who-still-needs-a-name? Well, you’re awfully sweet. And as you already know, I had a fantastic time and am totally plotting my return for Round 2 with Rilla. Hmmmm … My brother graduates from med school in June … Doesn’t he need a family representative to attend and offer moral support before sneaking out to la mesa? @Hannah, YES, he does! And possibly he also needs to see a certain young niece with a flair for writing 😉 whom Rilla is dying to meet? @Ami, maybe if you promise to name the baby Jeremy you could talk him into it! Or, um, Jeri? Jeremy is one of the names I like (and yes, it is very definitely a boy – or a three-legged girl), unfortunately a cousin already took it. I gave my husband a list of 30+ possibilities, but he is still walking around saying, “It’s a BOY?? ?”, so I’m not looking for a decision any time soon. Since this is a book post, can I share good news here about books (that you probably already know! ), and also make a recommendation? THERE’S A NEW PENDERWICK’S BOOK COMING IN MAY!!! Not that we’re excited or anything… And another newfound favorite, in the same flavor as Penderwicks- have you read ‘The Incorrigible Children of Ashton Place:The Mysterious Howling’ yet? Maryrose Wood has just released the second book in the series, and we are howling with anticipation for our copy to get here! Hello! What a pleasant surprise seeing my book mentioned on your blog. Me happy about that. I’m also VERY HAPPY to hear the news of a new Penderwicks! I love those books. Also, I have to agree with Ami: Jeremy is a GREAT name. Not that I have a bias or anything. Thanks again! Have a marvelous day. Jeremy Tankard, what a treat! I’m delighted you stopped by! We’ve got more of your books on hold at the library and I can’t wait until they come in. I am such a fan of your work. As for the new Penderwicks book…a little bird *did* tell me there was a new one on the way, and this household is counting the days.